Linguatic Dictionary is a useful utility that will help you for all of your translation needs. You can use Linguatic Dictionary free of charge, distribute it freely to your friends and let them use it freely too. By becoming a member of Linguatic Community, you can forward your suggestion, criticism, and issues about Linguatic Dictionary through forum page in our web site. Linguatic Dictionary has so many user-friendly features for you. 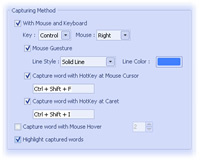 - By locating mouse cursor on a word and waiting for a selected duration of time. Auto Completion feature is more helpful when the exact word or phrase has forgotten. When you begin to type a word in the search textbox, a popup will help you displaying words or phrases list starting with the text typed into the textbox. 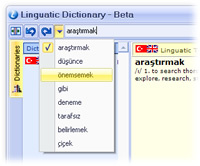 This feature can be used in both Linguatic Dictionary and in search page of the Linguatic web site. 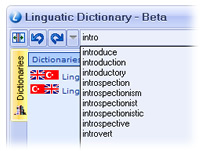 With Linguatic Dictionary you can quickly translate words on e-mails, web pages, documents, or instant messages. Capturing any text feature works in many Desktop Applications , such as Word, Excel, Outlook, Internet Explorer, Adobe Reader and all instant messenger programs. When you press enter or click search button after typing word or phrase in the search textbox, that word or phrase is searched for all dictionaries in the Linguatic database and results are displayed in the form of dictionary terms grouped by dictionaries. - With exact word option, searching in database performs with characters of written word exactly. - With including option, searching in database performs with all words including characters of written word. - By Begins with option, searching in database performs with all words beginning with characters of written word. - By Ends with option, searching in database performs with all words ending with characters of written word. 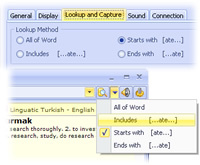 Linguatic Dictionary records last 100 searched words in a Lookup History, through this feature, previously searched words can be listed and searched again any time. 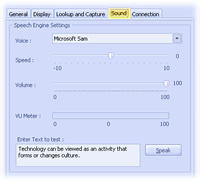 You can learn pronunciation of the word or phrase with Text-to-Speech Engine Feature. Linguatic Dictionary permits you to change skin types and customize them according to your preferences. Linguatic Dictionary can be used with one skin by choosing from more than 45 skin types in settings window -> display tab. You can also change hue and saturation of active skin. Linguatic Dictionary can be used to be automatically downloaded and upgraded when its new version is released. Connection settings and auto update schedule can be changed in settings connection tab. 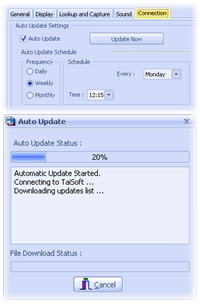 Auto update process can be made manually. Linguatic Dictionary has multi-language support. Interface language of all windows can be changed easily and instantly in settings display tab.